Hydrobike | It's just like riding a bicycle on water. No matter the season, Hydrobikes are the perfect adventure, whether you’re vacationing or looking for something new and fun in your own neighborhood. 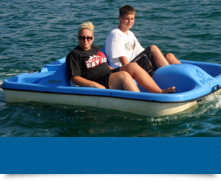 Hydrobikes are incredibly stable, have a cubby to hold your belongings and cup holder for your favorite beverage. The Hydrobike is the ultimate in human powered watercraft. With little effort you can cruise at 5 miles per hour. They can easily be ridden in even the windiest and waviest conditions. 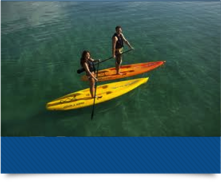 They are virtually impossible to tip over, environmentally friendly, and a great way to exercise while having fun on the water. 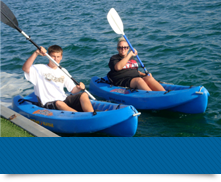 Hydrobike Rentals are on a first come first services basis weather permitting. Working out with a Hydrobike. Less muscle strain but more work done. Low impact on the knees. Traveling in the water eliminates risks of accidents. The hydrobike will help you burn fat at a phenomenal rate. Your leg and calf muscles get stronger and enable you to gain muscle strength. Even though many contemporary fitness experts are not aware of the Hydrobike and the amazing fitness exercises which can be performed using it, some fitness experts are already advocating the use of the hydrobike for getting fit and staying healthy. 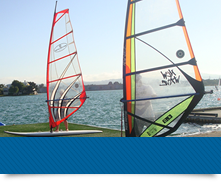 Students/Renters of Windsurfers, Kayaks and Stand Up Paddle Boards must know how to swim, complete and sign California Windsurfing’s waiver agreement, acknowledge they understand and agree to be bound by its terms and conditions. 12:30pm to 7:00pm Tuesday through Friday. 11:30am to 7:00pm Saturday & Sunday.